NOTE : Before setting up VPN please make sure that your on-premise network is different from AWS, it should not overlap which might result into failure in communication. for eg: AWS VPC network is 10.0.0.0/16 and your on-premise network is same 10.0.0.0/8 or 10.0.0.0/16 which is overlapping hence the communication is not possible in this case. These procedures assume that you have a VPC with one or more subnets, and that you have the required network information. In the navigation pane, choose Customer Gateways, and then Create Customer Gateway. In the navigation pane, choose Virtual Private Gateways, and then Create Virtual Private Gateway. Once Virtual Private Gateway is ready, Go ahead and attach it to a desired VPC for which you want to setup VPN connection. Once, customer gateway and virtual private gateway is created you are ready to create VPN connection. 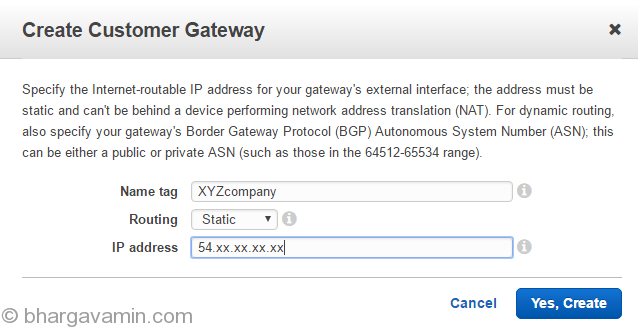 Customer Gateway’s IP address field you can use already created customer gateway or you can create new one as well. BGP ASN keep it default 65000 you don’t require to change until you have a BGP enabled Firewall for VPN. Routing Options field select Static and enter the on-premise internal network range. After creation you can navigate to Tunnel details tab to see the status of tunnels. By default status will be down until you configure same VPN connection on your on-premise. Once you have created VPN connection from AWS end, Now you have to configure VPN connection from on-premise. for that you have to download configuration’s in terms of the device, vendor and software of your on-premise firewall. Note: You can use generic if your device is not listed. Further step are different for every device which will be listed in a text file downloaded. follow that and you should be able to configure VPN connection on on-premise firewall. Once tunnel is status is “up“, that means VPN is active. In your next step you have make changes so that instances from that VPC can connect to on-premise instances. In the navigation pane, choose Route Tables, and then select the route table that’s associated with the subnet; by default, this is the main route table for the VPC. On the Route Propagation tab in the details pane, choose Edit, select the virtual private gateway that you created in the previous procedure, and then choose Save. In the navigation pane, choose Security Groups, and then select the default security group for the VPC. On the Inbound tab in the details pane, add rules that allow inbound SSH, RDP, and ICMP access from your on-premise network, and then choose Save.If you want to allow all the traffic for on-premise network the rule would look something like this. Or if you all ready have an instance running, just go ahead and try to ping to on-premise network computer. If routes are configured properly then you should receive reply for icmp ping. These are the major things where most of the problem lies. If you still couldn’t figure out the you can write me up about the problem and I’ll try to help you solve it. 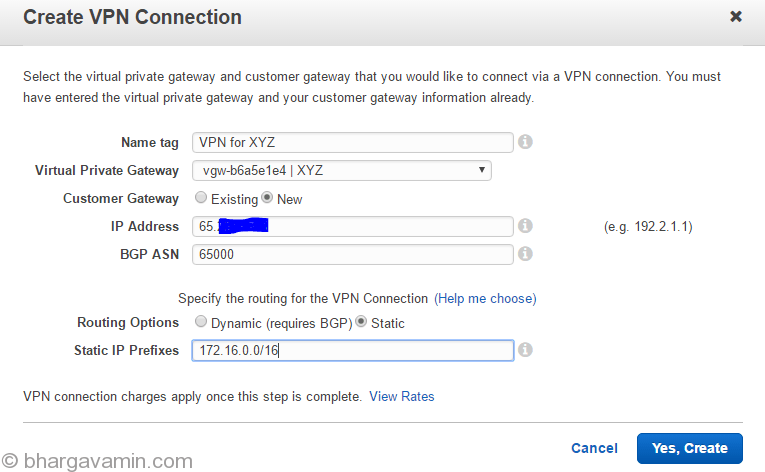 Thanks for reading, Hope Setup VPN connection AWS article helped you setup a VPN connection of your own! Previous post What is Stephan Hawking’s Breakthrough Initiatives?